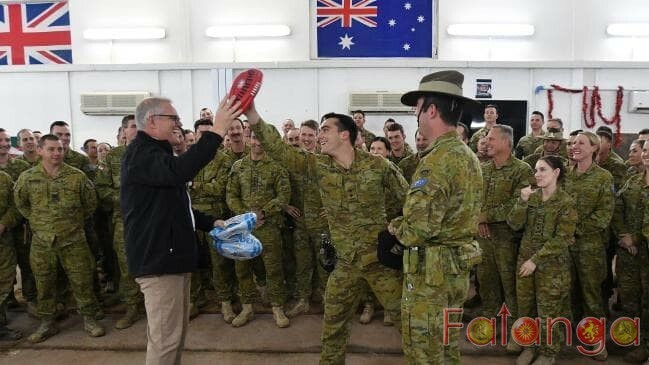 Scott Morrison has visited Australian troops stationed in Iraq for Christmas in a secret trip to the Middle East.. The Prime Minister met with 800 troops in Iraq to thank them for their service ahead of the holidays. The Australian forces are training Iraqi troops to fight Islamic State. He was also due to visit Afghanistan but the trip had to be cancelled because of security concerns. “I understand it’s a sacrifice - I understand it’s a big thing to be away from your family at this time of year - and that’s why I’ve decided to come just to say thank you from one Australian to another,” he told troops at the Taji Military Complex north of a Baghdad. “On behalf of my family, to you and your families, I want to say thank you very much for your service,” he told ADF members. “But I also want to thank you as a prime minister, as the leader of the government, as a member of the Australian parliament, on behalf of our entire nation. “For many it’ll be their first Christmas away from family on a rotation. For some it’s something they’ve done many, many times and they have their own special traditions that they’ve been able to work up with their families and their kids to try and still make sure it’s a special family time.